Abdul is both and brought up in Kolkatta, and now lives at Nallasopara. He arrived in Mumbai around 15 years ago, to teach children the Holy Quran and Namaaz in Masjids and at homes. His parents are uneducated, and are farmers, and they educated him and his siblings, 7 brothers, all of them teach the Holy Quran! He has two sisters. They had some land of their own but they had some losses in farming and had to sell most of their land. Abdul’s family lives in the village and he has one daughter and one son, both study in school. He teaches children in the Bandra and Santacruz area and cycles from one home to the other and to the Masjid near Hill road where he teaches too. He needed a bicycle because his own bicycle was stolen a few weeks ago. He has never encountered anyone who ever offered him a bicycle to better his livelihood. The biggest challenge he’s ever faced is when he fell seriously ill (a liver related problem) a few years ago and could not work. In that same period even his mother expired, so coupled with that it was a very difficult time for him and his family. (Appreciation of your work, and respect even after years, are the true earnings of a Teacher, I thought as I saw Abdul Maulana ji ride away, wearing a white Pathani pyjama kurta. 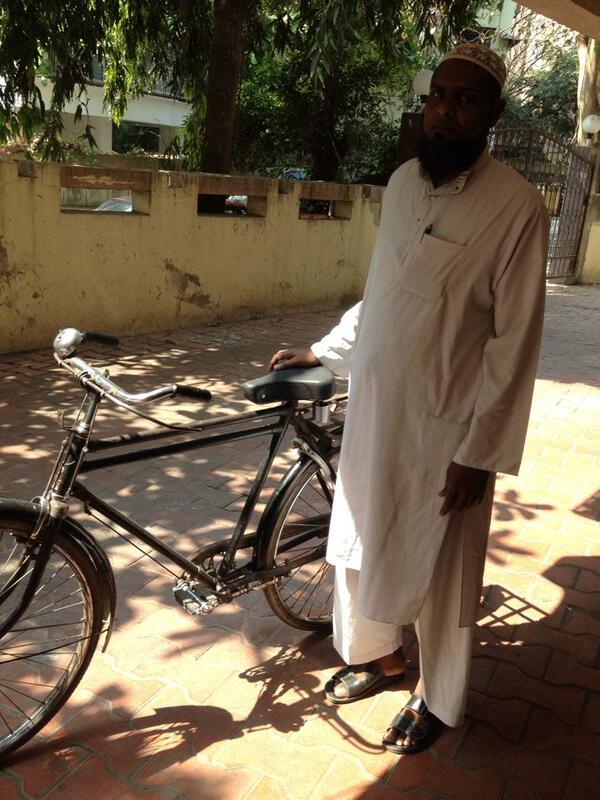 Thank you to Surabhi Shah for donating a new bicycle to Egg seller Shabbir; we donated Shabbir’s old bicycle, that we received in exchange of the new, to Abdul maulana ji. Shabbir’s father was an egg seller too. Shabir is in this profession since 3 years. Three years ago, one day it was raining and an autorickshaw banged into his father’s bicycle and his father injured his knee and cannot ride thereafter. So Shabbir had to give up his education midway, 9th Std., and migrate from his village in UP and come to Mumbai to take over his father’s egg selling profession to earn a livelihood for his family. Shabbir sounded very sad when he mentioned he had to leave his education midway because of his father’s misfortune. And since his father is immobile, he runs a tiny grocery (Kirana) store at home that earns them a little money. They live in Khar Danda. Shabbir has a family of 3 brothers and 3 sisters. Two sisters are married. He and his father together managed to bear the expenses of their marriages, both his brothers are younger to him. His sister and his brothers are studying, and Shabbir has a dream to educate his younger brothers to any level they wish. I asked Shabbir, considering they are a close knit family, and he respects his father immensely, what has been the best advice his father ever gave him? Shabbir told me, he was not keen to follow in his father’s footsteps and become an egg seller, especially because he felt it is risky to ride a bicycle on our streets and he told his father he wants to apply for a government job, a secure job. Shabbir carries 1200 eggs on his bicycle! 50 to 60 Kgs! Every day! Two months ago he suffered two accidents and lost a lot of eggs, nearly 600 to 800, in both accidents, luckily he was not injured. Shabir mentioned very often that when he rides, he feels insecure that he too will have an accident! I realized his father’s bicycle accident has left a deep negative impact on him. I advised him to get rid of this reoccurring and persistent fear in him, because unless he stops thinking of the negatives, the possibility of another accident he may never ever be free of them! He agreed to be less fearful and more confident hereafter, especially now that he has a new bicycle to ride, he added. I was glad he was receiving a new one in exchange of his old. He mentioned no one has ever given him a deal like this ever before, where he will receive a new bicycle in exchange of his old, and his old bicycle will be donated to a needy person who needs one to better his livelihood! He was mighty impressed! It’s thanks to the donors, I assured him. 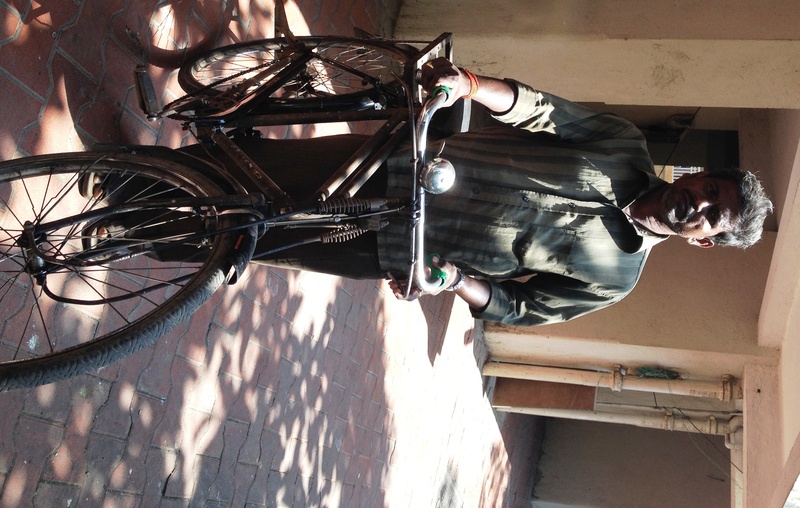 He was very thankful to the donor of his bicycle, Surabhi Shah. I asked him what has been his happiest moment so far?, He replied, ‘When I earned a lot of money selling eggs, when I had recently taken over my father’s profession, I felt very happy earning that money for my family. He said “I was happy seeing my parents happy that I had earned that money for our family! That made me very happy, their happiness!’ He gave me a wide grin. Thank you to Surabhi Shah for donating a new cycle to Shabbir; Shabbir’s old cycle we will be donating to a needy person. Surendra is from Kanpur, and migrated to Mumbai nearly two years ago. He even needed money to get his sister married, so he came here to earn a livelihood as an electrician. He has 3 brothers and 3 sisters. His father is a farmer. He left his home and village so that he can help support his entire family, as his father alone is unable to provide for such a large family of seven children! Even now Surendra sends money home every month to support his brothers and sisters. He sends nearly Rs 3000 to 4000 to his family every month. All his sisters are educated! Far from them, he misses his family even today and calls them often to speak with them. He is married, and his wife studies at Rizvi college, completing her 12th Std, and he hopes she can become a tailor someday and be independent too, he is paying for her education. When he arrived in Mumbai, he first worked at a Grocer’s shop delivering goods before he decided to become an electrician, because, back in Kanpur, whenever he had an opportunity to do any kind of electrical job in the neighborhood, he realized he had a knack for it and everyone would call upon him for fixing stuff. He would also be called to light up wedding functions. He realized he understands the electrician’s field very well even though he did not study it formally. It’s only after he dumped the job at the grocer that he took up a job as an assistant with an established electrician to learn the field professionally. He loves his job, as he is comfortable working with live wires and circuits. He does not have a cycle, so he says when he has to travel to different locations for his job, or carry his tool box and kit it takes more time and expense using rickshaws. With a cycle he can reach more places faster and at far less cost too. No one before ever gave him such a deal, a cycle for free for his livelihood needs, he mentioned. I asked him who is his best customer, he said it’s a woman in Sherley Rajan, Bandra, Anita (Madam), she treats him with respect and talks to him with kindness and enquires how he is when he visits her on jobs. 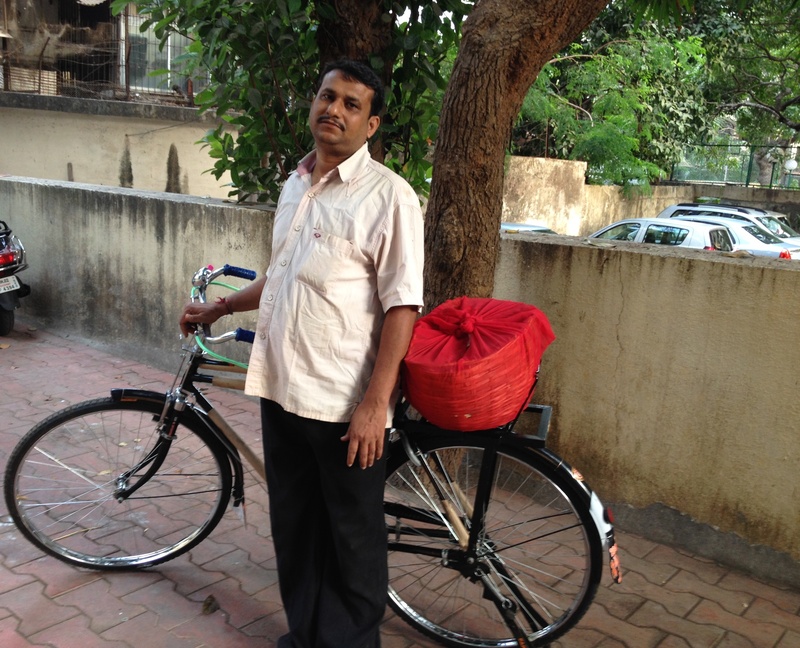 Thank you to the donors of Surendra’s bicycle (which we got in exchange of the new bicycle they donated to milk man Murugan) – surabhi shah, murali krishnan, dr. niraj vora, javed mahadik, and farzana suri; Thank you dear all. Murugan is from Tamil Nadu, and the first time he came to Mumbai was in 1992. He is in the milk profession since 20 years. Earlier, he was working as a Peon, but the income from that one job was not sufficient for his family, so he began delivering milk early morning. 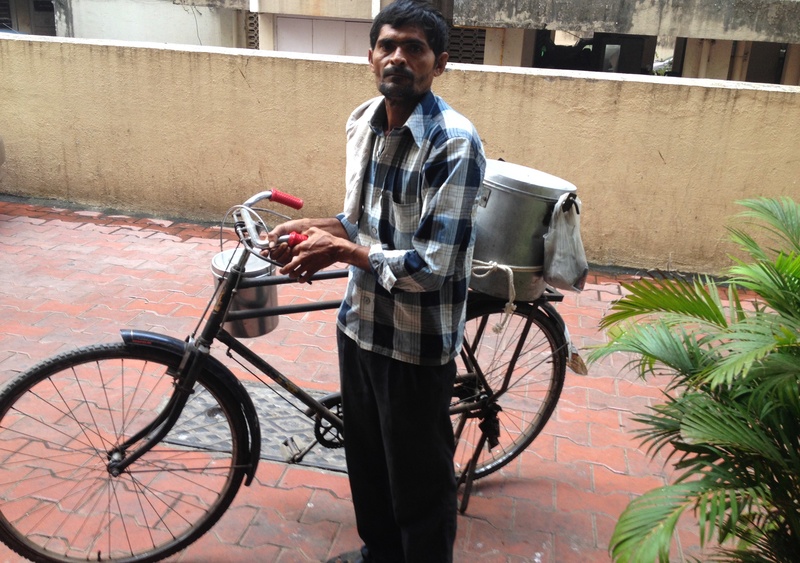 He begins his day around 4 am, and finishes delivering milk to various households in Chembur by 8 am. He was recommended to me by one of the donors of his new cycle, Murali Krishnan, my rider pal. He arrived in Bombay because there was no rain in the village he lived in, and they could no longer farm; his parents and he being uneducated, (he has studied in Tamil up to the 3rd Std.) he had no options but to leave his village and look for work in Mumbai. He comes from a family of 6 brothers. His family would grow vegetables but the wholesalers would not give them a fair price and exploit their poverty, so he decided to leave farming and his village for good. His most challenging times were the years he spent in his village, they hardly had food to eat, sometimes just once or twice a day. His father even sent him away to Udipi to work in a restaurant. He has been working every single day of his life ever since he was 11 or 12 years young; he has hardly seen any other good life, other than that of work, he said. Murugan has two daughters and he says proudly they are very good in their studies. His wife is uneducated so she is a homemaker, he said. Because he was uneducated, he was very keen both his daughters study, so he put them in an English medium school when one of his customers volunteered to give him a friendly loan for their school fees. He purchased his own house lately, his wife helped by selling her gold jewelry. He is very proud that he finally owns his own house! Hearing that he has received help quite often from some of his customers, I realized many people living in Mumbai are most willing to help the needy, especially someone they know. Furthermore, hearing him tell me that he paid off his loan on a daily basis, made me realize Murugan is not only an honorable man, but also super intelligent! Because, before it becomes a burden for him to return the large amount of money loaned to him, Murugan had realized its best to pay off the big loan bit by bit daily, that way he will not feel any burden of paying back his huge debt. I asked him which has been his happiest moments in life?, he replied, ‘When my two daughters were born. (he smiled); and now when they get good marks in school, I am very happy. (now his whole face lit up with his widest smile possible!) I tell both my daughters that after your daily bath, and before your studies, you must pray to God. God is everything. That is even what my mother and father taught me. Our highest salute, to Murugan and his Mother! And his two daughters for doing well in their studies, making their father proud. The following donors contributed towards buying a new bicycle for Murugan: surabhi shah, murali Krishnan, rakesh bakshi dr. niraj vora, javed mahadik, and farzana suri; Thank you dear all. Thank you to Kohinoor Cycles (http://kohinoorcyclestores.blogspot.com/) Siddharth Vora (https://www.facebook.com/siddharth.vora.58?fref=ts) for the good discount and service. Salikram is from UP; he is a gardener since 8 to 10 years. Before this, he was a farmer and even a farm laborer. He arrived in Mumbai around 8 to 10 years ago, when he could no longer sustain his livelihood of farming, and when his father died; the income being generated from farming was too little for him to meet his family’s needs, so he had to migrate to a city. As a gardener, he said he earns around Rs 8500 a month. Salikram has five children, 2 girls and 3 boys, he is educating them all in schools. He has three brothers and is educated till the 10th Std. His family lives in the village, he lives alone at Juhu, in Mumbai. This bicycle we donated to Malee Salikram, (thanks to Dr. Niraj Vora; btw, this bike is Dr Niraj’s 4th bike donation), he said he needs it to ferry earth, manure, fertilizers, gardening tools, etc. and also to travel to the four places at different suburbs he works at. I asked Salikram when was the most difficult period of his life? ; he replied, ‘When my parents died, around 10 years ago, he faced a very difficult time. Both died of Asthama, and that is when he had to migrate to Mumbai to earn a livelihood better than the farming they were doing. Even his elder brother died of Asthama, and that was also a very sad time; Salikram provides for his brother’s widow and family too, along with his own. He said being the eldest child, he must take care of all his brothers and their families. ‘A man with a great sense of responsibility, and noble indeed…’, is what I thought of Salikram, as I was getting to know him better. He told me he has never owned a bicycle before in Mumbai, and this is the first time in his life someone offered one to him for free! His father was in the same profession and would ferry them on his bicycle. His family consists of his mother, his wife, his son, his sister (married), and two brothers. His one younger brother also sells Paan leaves, and the other youngest one works in Titan Watch co and is unmarried as yet because he had to look after his father. He chose this profession only because his father was in it, and he had no other skill or education to fall back on that would have provided him options and knowledge of career choices, because he is just 8th Std pass; When he said that with such a regret, even though he likes his profession, I realized, how important education is; it offers us knowledge and thus more choices in the world beyond our immediate home and next meal. Education can lift us from the circle of poverty, I feel too. The reason Kamlesh could not study beyond the 8th was because his father suffered a kidney problem and he had to start earning his living to support his family. He said proudly he is educating his son in an English medium school so his son can have better chances in life and career than his father ever had. He likes his profession, but Kamlesh himself does not eat Paan. He too said it is not good for our health when had with tobacco. Every leaf he sells has to be cleaned with a cloth before he sells it, it is a time consuming and delicate job, as the leaves arrive almost covered with black and brown earth. I thought about what he just said so simply, as a matter of fact. I also wondered about the fact that he does not wear the most important gear that we privileged well to do professional and hobbyist-cyclist wear – the Helmet; Amazingly, almost none so far, Kamlesh is the 45th recipient, have ever met with an accident, and I know this because I had asked almost all of them this question! A big thanks to such recipients of new bikes who willingly and happily spend nearly Rs 400 to 1000 on their old bikes before they hand them to us, making them most worthy of further donation to someone who needs one to better his livelihood. 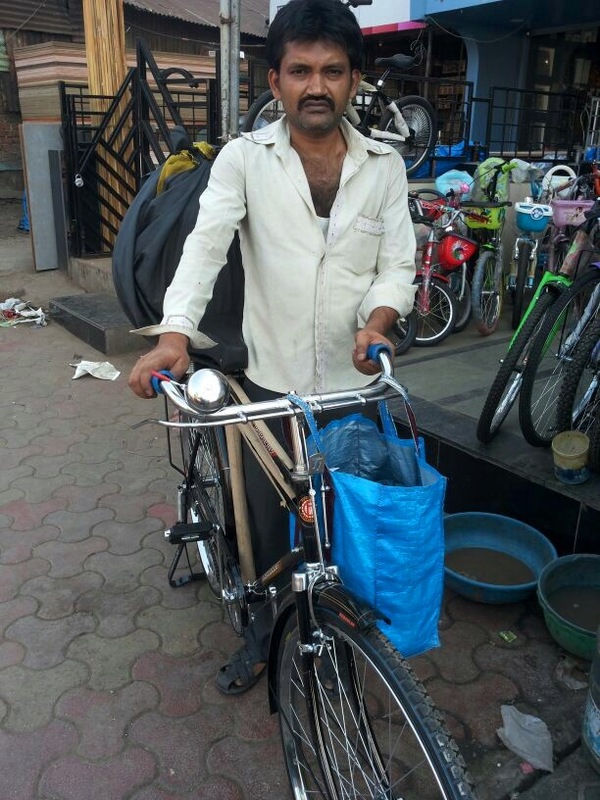 Kamlesh’s old bike will be donated to someone who needs one for his livelihood. Their observation makes me think to myself, ‘Hmmm, maybe it’s thanks to the fact I meet each and every recipient (of the donor’s hard earned money entrusted to me without a single question) myself, and the fact that someone they (the recipients) do not know is helping them better their livelihood, I guess these two facts help them speak straight from their hearts to me, and thus they touch you lovely people. “I have never met with an accident riding my bicycle in over 20 years! Because I ride very carefully. I am always thinking of my family waiting for me at home.’…. Is what remained with me on all my pleasure-rides or cardio-rides thereafter, long after he had left my place; My loved ones waiting for me back home keep my speed in check, I too realized. Thank you to Dr Niraj Vora; (I think this is the 3rd or 4th bike he’s donated!) And thank you to Kohinoor Cycles (http://kohinoorcyclestores.blogspot.com/) Siddharth Vora (https://www.facebook.com/siddharth.vora.58?fref=ts) for the good discount and service. In the village he would work as a daily wages worker lifting bricks and sand at building and road construction sites, for Rs 50 to 100 for a day’s work. He is uneducated, never been to school. His father too was a construction site laborer, and they are 5 brothers. Guddu is selling Samosas since 15 years. Before that he used to work in a Milk Dairy and a relative of his who was a Samosa seller introduced him to this profession. When he told me his income from Samosas, I had no words to express how little some people manage with: he buys one Samosa for Rs 5, sells it for Rs 6, earns Re ONE on one samosa, and that does not include the cost of the Chatni he gives with each and the cost of the paper plate. He sells around 60 in the morning, then goes back to the seller to buy another 60, and before midnite sells them all off. His customers are the livelihood bicycle people who ferry goods on their bikes, the Bhangaarwala (waste goods man) and auto rickshaw and Taxi drivers and Tea sellers, Paan shop owners, and sells them in the lanes of Bandra and Khar. Guddu has two children, one boy and one girl, both study in a Municipality school. Guddu sticks to the lanes because the Police harass him if he walks on the main road pavements to sell his snacks, but even in the lanes he is harassed so often has to hide when he sees a Police man or Police vehicle. I think because he is an unlicensed hawker he gets into trouble with the cops, I guess. When he said that I thought how sad that some people live their lives just in lanes all life, and never get to the super highways that we rich walk and fly on. I asked him if he would like to say something to the donor of this bike, Javed Mahadik; he replied, ‘I will pray for him that he be blessed always. As for my profession, I will sell Samosas until there is breath in my body. I will walk until I can walk and do my profession. I assured him his ID proof is not mandatory, only his need for a bike is. 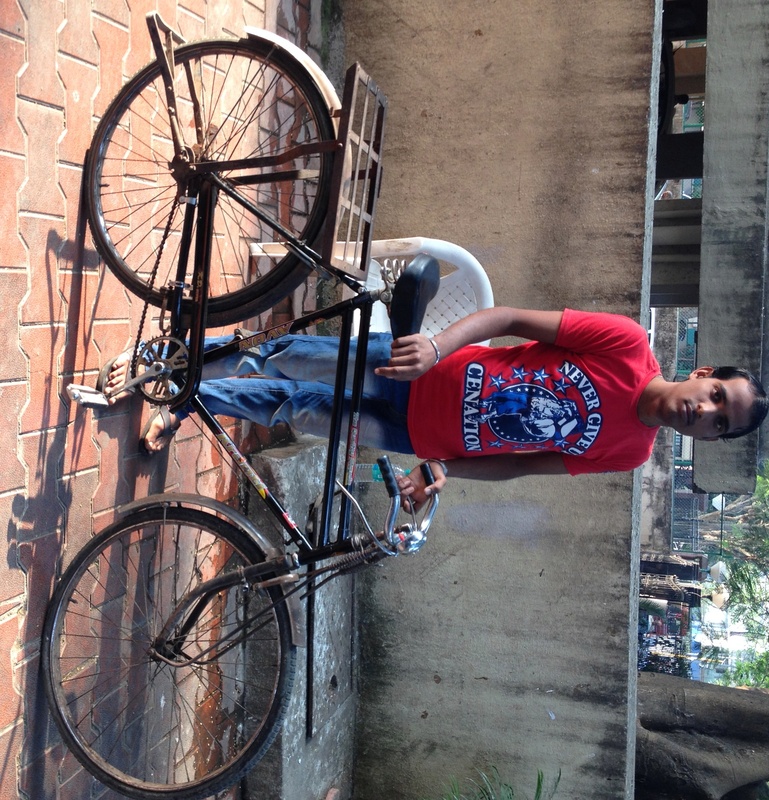 Thank you Javed Mahadik for donating this bike to him. And thank you to Kohinoor Cycles (http://kohinoorcyclestores.blogspot.com/) Siddharth Vora (https://www.facebook.com/siddharth.vora.58?fref=ts) for the good service. Basant is from Odissa (Orissa), lives in Null Bazar, Mumbai, sells Paan leaves in Bandra west area. He is in this profession since 22-25 years. Basant arrived in Mumbai in 1993, under the most vivid circumstances, stuff that movies are made of! He was a young boy aged around 15, living in his village at Odissa, and one night he was watching a Nautanki (travelling drama, song and dance show) that was performing in his village and he fell asleep watching the show. When he woke up, early morning, he realized he is traveling in a Truck!, and the truck is travelling in a area he is not familiar with! He raised an alarm and the truck driver stopped, and was shocked to find him (a stranger, a boy) on board his truck. Though he could not understand Hindi, Basant was smart enough to tell the driver that he has originated from the same village from where they got the consignment of paan leaves. The driver and cleaner soon realized young Basant had fallen asleep at the back of their truck watching the drama show that they too had been enjoying last night in his village. The truck was carrying paan leaves meant to be delivered to Mumbai, and had already crossed the Odissa border and was moving towards Maharashtra. The truck driver decided to continue on his journey and assured Basant they will take him back to his village on his return trip from Mumbai. The driver knew some families staying in Mumbai (from Basant’s village in Odisaa) and he kept Basant in their care, while the truck was in Bombay delivering the consignment. However, during the return trip back to his village, Basant decided he wants to continue to live and work in Bombay because his father was too poor to do anything for him by way of his education or food needs, and so at Busawal (near Nasik) Basant jumped off the truck when it stopped someplace, and he escaped into the darkness of the jungle. When he reached Nasik, he worked at a tea stall for Rs 20 a month for about 2 years. Then he found his way to Bombay and traced the people the truck driver had sold the paan consignments to, and began working for one of the suppliers, wholesalers, of paan leaves. It’s evident he succeeded, because he made a family and life thereafter, selling the very same leaves that accidently had carried him to Bombay!!! ‘Wow! That’s taqdeer, the power of destiny!’, I thought fascinated hearing his most fascinating story! Basant worked for the whole-supplier (Manoharji) for around 10 years, and because he served him loyally and worked hard, his master (Manoharji Babulal Sitaram) encouraged him to start his own wholesaling-line of paan leaves, by offering him an interest free loan of Rs 10,000; thus made him financially independent! My salute to Manoharji, because he also gave Basant money when he needed it to get his sisters married! Truly an angel! Both his children, daughter 14, son 4, are studying in English medium convent school; and both are first class students, he beamed in joy. He told me, ‘I want to educate my daughter to very high standards, I want her to do what I could not. About the leaves he sells he had to say that he cautions people from adding tobacco in banarsi and culcutta paan leaves, while having them, and assured me it’s a medicinal leaf if it’s had without the poisonous tobacco; its very good for digestion and one must have a paan leaf after every meal, he advised me. The hurt he received from the fall was not the painful part of the experience, the most painful part was he had to sit at home for ten years without working, and that made him feel miserable, that he is not able to work and yet is a burden on the family’s scare food supply for ten years. Nd because he could not ride his bicycle for ten years, he gave his profession of selling the leaves to someone else and in return took a small commission from that man’s daily earnings for introducing him to his customers and for using his bicycle too, that meager income kept his family going for ten years. 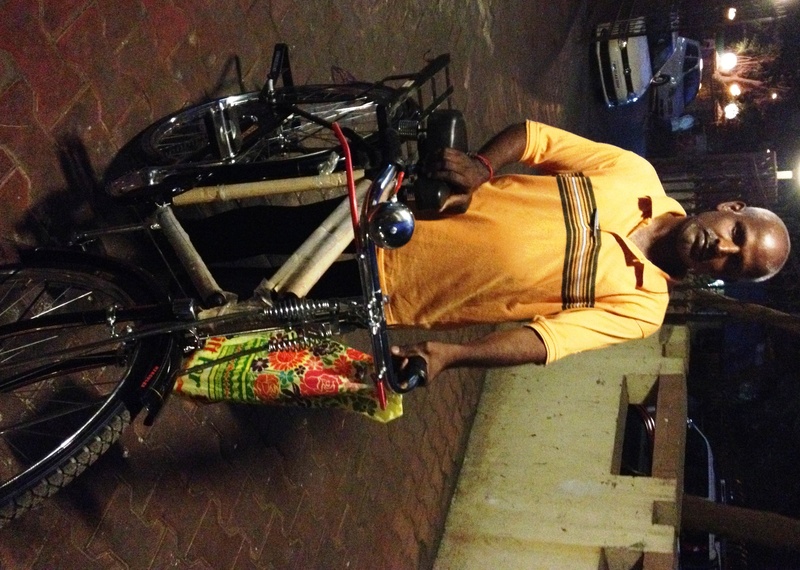 He is able to ride now, and sells the paan leaves himself riding shop to shop. He was so dam sincere in what he had just said, I tried hard to assure him, (in-between hiding my tears quite well), that his sincere kind words and prayers for me actually do not belong to me, because I am not the donor; I am just like that bridge between the water well and the thirst, I told him while accepting his sincere gratitude and prayers on behalf of the donor of his bike. Even long after he had left, two thoughts lingered in my consciousness, – his vivid road journey to Bombay in a truck delivering paan leaves, the very leaves that eventually fed him for life by becoming his profession!, and, his wife asking him to bring home a photo of me, the alleged donor!. Naturally, I never gave him a photo of mine, but only after he had cycled too far away I realized how stupid I really was, for not having logged on to FB when Basant had asked me for my photograph to show his wife! Because, I felt I should have logged on to FB and shown him a picture of Javed Mahadik, the kind donor of his wonderful new bike. 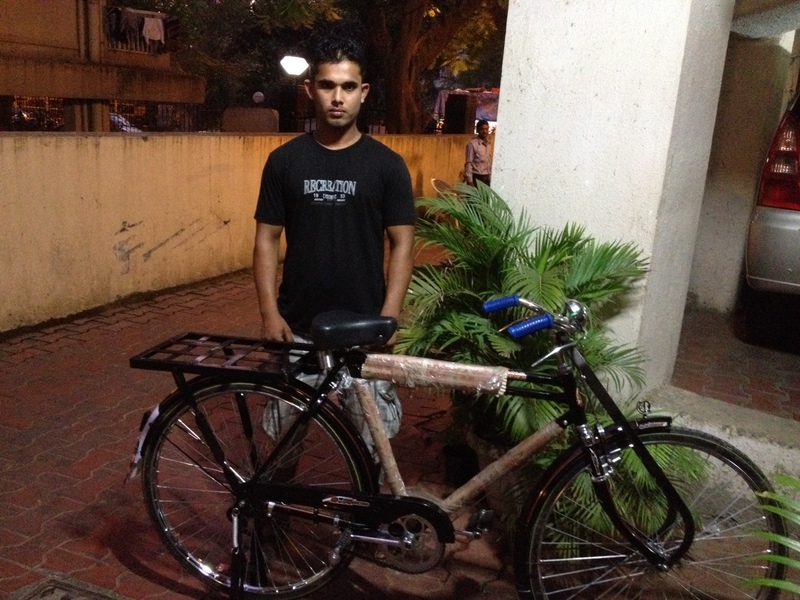 Basant gave us his old bike in exchange, which we donated to a samosa seller.